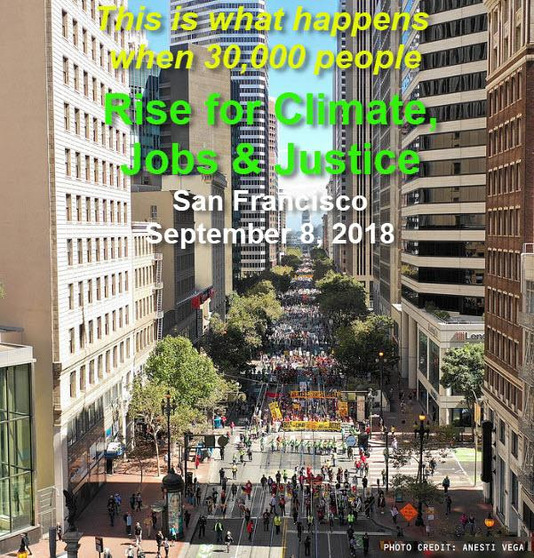 More than 700 trade unionists and other labor activists joined an estimated crowd of 30,000 people in San Francisco on September 8, 2018 to Rise for Climate, Jobs & Justice. 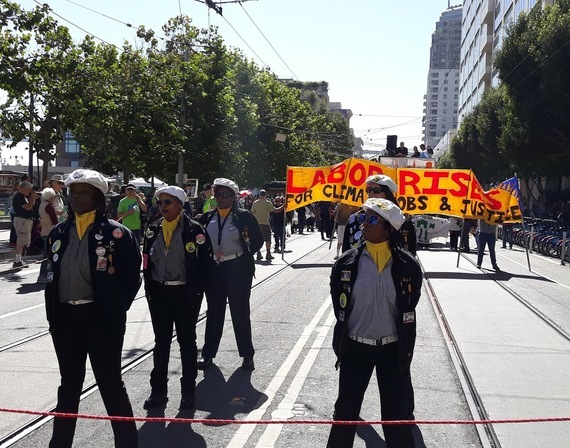 They came from more than fifty labor organizations, including three labor councils (San Francisco, Alameda and Contra Costa counties). 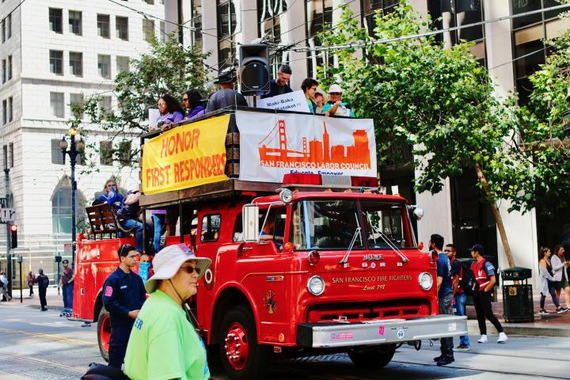 The Labor Contingent, led by the ILWU Local 10 Drill Team, included a fire engine honoring first responders driven by members of Firefighters Local 798, which also served as a speakers platform for a pre-march labor rally that included Lizzy Tapia from Local 2 HERE, and John Avalos from NUHW, with labor songs led by Susan Peña and Kathe Burick, AFT locals 1481 and 2121, chants led by SEIU and AFSME members, and a skit performed by members of La Colectiva de Mujeres. 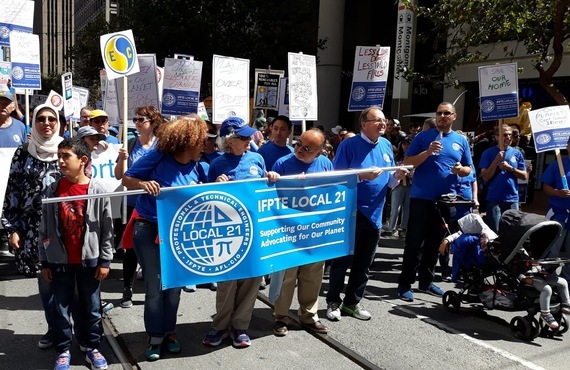 Norman Ten, President of San Francisco APALA (Asian Pacific American Labor Alliance) led a unity chant in 4 languages. The Brass Liberation Orchestra provided the marching band. Rudy Gonzalez, Exec. Dir. of the SF Labor Council, spoke for the labor participants at a pre-march press event. One highlight of the day was creation of the largest street mural ever painted in the streets surrounding SF Civic Center in front of City Hall. Teams of artists outlined the murals in advance. Painting was completed by volunteers from among the marchers as they arrived in Civic Center from the march up Market Street from Embarcadero Plaza. One of the murals was created by the Labor Contingent. This article and images are also available here. 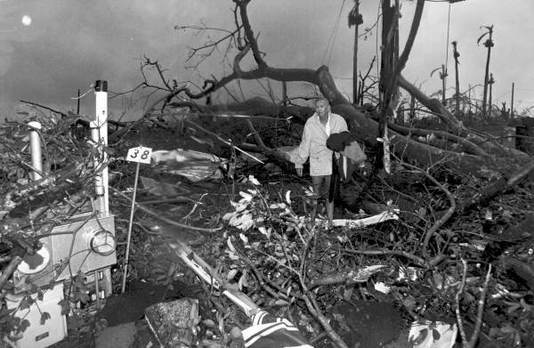 Photo: Taken Aug. 24, 1992, Harold Wilkins, 69, of Florida City walks through the rubble of what was once his home. Used with permission through Creative Commons, courtesy of Florida Memory. Cynthia Hernandez, the Executive Director of the South Florida AFL-CIO, recently gave a presentation on South Florida unions initiative to address climate change to a LNS videoconference, Cynthia can be heard 14 minutes from start time. we needed to have a conversation around the impact of climate change, not just on our members, but on our communities. So we realized that we could no longer ignore the fact that climate change is having an impact on all of us. We also wanted to get ahead of climate change policies and think about where new organizing opportunities were arising as a result of climate change. 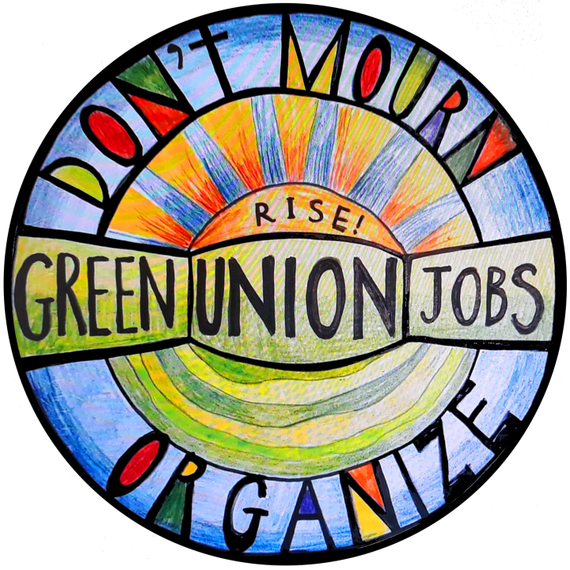 So in 2017 the Council began to build “a labor and community coalition to address climate change,” to “find solutions through organizing campaigns and a policy lens to build worker power in South Florida.” The coalition included AFSCME Florida, SEIU, International Union of Operating Engineers, South Florida Building Trades, United Teachers of Dade, and community partners who were working on climate change. Photo taken Oct. 24, 2005. 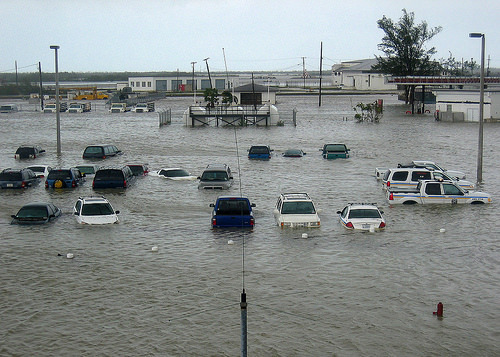 A parking lot on board Naval Air Station Key West, Fla., is flooded after being hit by Hurricane Wilma. At 6:30 am EDT, Hurricane Wilma made landfall near Cape Romano, Florida as a Category 3 hurricane. Used with permission through Wikepedia Creative commons, courtesy of U.S. Navy photo by Lt. Cmdr. Brian Riley. For transit workers and others paid by the hour, “during natural disasters their hours were getting longer and longer,” but also “their work was being disrupted” so that “many of them would be unable to work, and therefore lose pay. Longshore workers at the Port of Miami were without work at the Port of Miami during the last hurricane season because the Port was closed. After several days the Port was reopened, and workers were having to work longer hours to make up their lost time. Because South Florida and Florida is a tourist economy there has been a sharp decline in employment during hurricane season because there were fewer and fewer visitors booking hotels and coming to Florida. When the interviewers talked to teachers, “many of them identified children as the most severely impacted by natural disasters.” Many children from low-income neighborhoods of color depend on the two free meals they receive at school, which are breakfast and lunch. “Unfortunately when schools are closed, as they were last year for a two week period, often these children go hungry.” Also, “teachers were directly impacted because the school year was extended, so they had to work two more extra weeks at the end of their season.” Teachers also noted that classrooms and schools were damaged because of the weather. Workers often have to “work excess hours” without “time to look after their own homes.” Many folks were living in evacuation zones; “they were still forced to go in work.” Many “had to leave behind their homes, their families,” and “many of them actually refused to go in to work because they had to take care of their homes or because they were in evacuation zones and became climate refugees.” Their unions were able to get their jobs back. The coalition recently held a retreat to organize a campaign around these issues. “Public school bus drivers have begun to test the temperature readings on school buses.” Soon agricultural workers will start taking temperature readings in the fields. The coalition has also developed “a curriculum and workshops on the basics of climate change in South Florida” and is sharing it with unions and their members. And it helped coordinate the September 8 People’s Climate Movement march in South Florida. 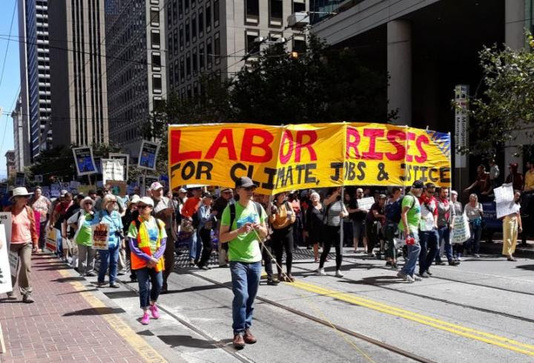 The youth climate movement Sunrise has issued a call for a federal Jobs Guarantee that would provide jobs for all, focused on the transition to a climate-safe economy. 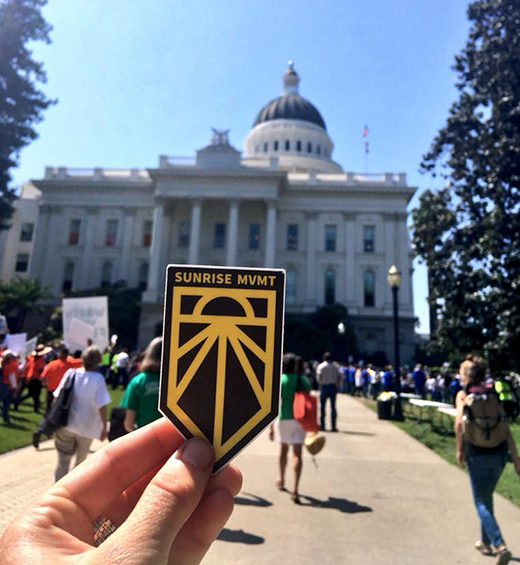 Sunrise is a movement “to stop climate change and create millions of good jobs in the process. Two Sunrise leaders, Varshini Prakash and Sarah Meyerhoff, called in their article “It’s Time for the Climate Movement to Embrace a Federal Jobs Guarantee” for a policy through which “the government directly employs anyone who wants a job but doesn’t have one.” Polling firm Civis Analytics says a jobs guarantee is one of the most popular issues they’ve ever polled 52% in support and 29% opposed. Polling by Sunrise indicates that support for a jobs guarantee focused on climate protection is even more popular. 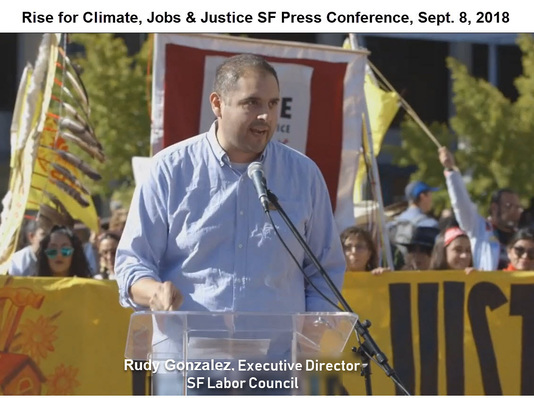 Sunrise’s “Climate Jobs Guarantee Policy Primer” says that by making a Jobs Guarantee a headline demand for the climate movement, we can end the “jobs vs. environment” fallacy forever, rally unprecedented public support behind climate action, and ensure that JG proposals include jobs for a just and rapid transition to a zero-carbon, climate-resilient economy. LNS is working with Sunrise and other groups to develop a labor-friendly strategy for a climate jobs guarantee. The construction industry has a vital role to play in meeting Canada’s climate goals by supporting production in other sectors, including electricity generation, efficient buildings, and new transportation infrastructure. Canada’s ability to meet our climate goals will be based on the construction of new facilities for the generation of electricity using renewable sources, including hydro, wind, solar, tidal, biomass, and geothermal energy. In addition, it will require the construction and maintenance of more efficient buildings and transportation infrastructure. 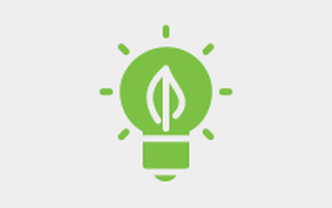 These net zero initiatives will require the work of a variety of tradespeople, including masons, boilermakers, pipefitters, insulators, electrical workers, glaziers, HVAC, linemen, ironworkers, and other construction trades. 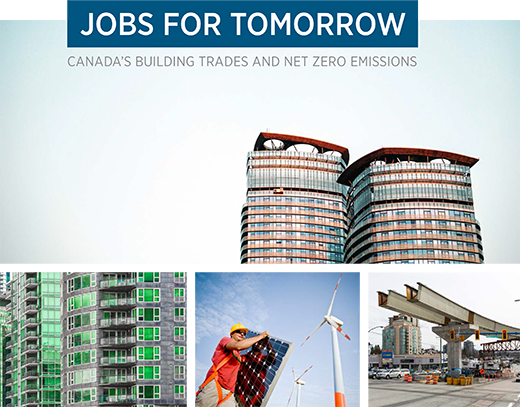 Bob Blakely, Canadian Operating Office for Canada’s Building Trades Unions, says, “This study shows the important and continuing role for our members as we transition to a low-carbon economy. Copyright Labor Network for Sustainability. 2018. Content may be re-used with proper attribution.